HeliCal has been successfully tested on Linux, Mac OS X and Windows. It simply requires the Java Runtime Environment (JRE) version 1.5 / 5 or more to be installed on your computer. Also, you need a Google Calendar account. Download and copy helical1.0.jar into a folder of your choice, then simply double-click on the file to launch HeliCal. If HeliCal refuses to start, you will need to install the Java Runtime Environment (JRE) version 1.5 / 5 or more. 1. By entering your Google user name and password. Pros: you will have instant access to all your calendars, and they will appear with the right colors. Cons: you will have to type your password each time you launch HeliCal. Most importantly: even though HeliCal is totally spyware-free, you must keep in mind that there might be security issues unknown to us. 2. By entering your Calendar addresses. 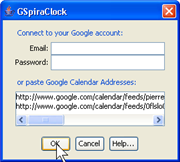 Paste the XML private or public addresses of the calendars you want to be displayed in HeliCal. Pros: this method is safer. Your calendar addresses will be cached on your hard disk and could be read by third parties, but such information is much less sensitive than your password. Also, private addresses can be regenerated. Cons: the process is more complicated, and your event colors in HeliCal will not match those of your Google calendars. Once you click "OK", you will see the confirmation window above. Just check the calendars you want to be displayed in HeliCal. 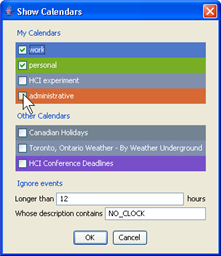 You can return to this window at any time by clicking "Calendars..." in HeliCal's pop-up menu. Now you should see a HeliCal window with an analog clock inside, similar to the screenshot above. If your clock is empty, add a dummy event to one of your active calendars, starting about 1 or 2 hours after the current time. Then, bring the HeliCal's pop-up menu and select "Reload event". Click on an event to jump to its starting time. After a few minutes navigating into your events, you will get used to the visualization. More details can be found in the SpiraClock web page. In some cases, you might find the visualization not accurate enough. For example, as an event is getting closer you might need to see how many minutes are left. In that case, you can double-click on the minute hand to switch to the "minute mode". Again, see the SpiraClock web page for further explanations. A: Make sure you have the correct JRE installed (see the "Requirements" section). Q: How can I have HeliCal started automatically? A: Under Windows: use the right mouse button to drag the .jar file towards the "Startup" folder of your Start menu. Then, select "create a shortcut". A: Make sure you have properly configured your Google Calendar's time zone. A: Bring up HeliCal's pop-up menu and select "Reload events". A: Bring up HeliCal's pop-up menu and select "Reload events". Then, select "Calendars..." and check the calendars you want displayed. A: HeliCal does not display all-day events. A: Most often you can ignore these messages. We are currently fixing this problem. Q: Isn't HeliCal taking up lots of my system resources? A: Yes, since it runs on the Java Virtual Machine, HeliCal will take up a good amount of RAM. But not much processing power though, since it only needs to redisplay itself every minute. Q: Why not making HeliCal a Google/Dashboard/Gnome/... widget? A: That would be great, but unfortunately we don't have time to do so. If you want to work on this, we'd be happy to provide you with the source code. Q: Why isn't HeliCal open source? A: We are currently in the process of creating a sourceforge project for SpiraClock and HeliCal. A: No. You can freely use the idea for commercial and non-commercial purposes. 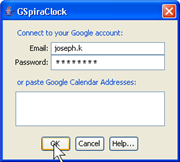 SpiraClock has been published in 2002. Q: Why not make HeliCal/SpiraClock a physical device? Check the ambientclock.com web page. Q: I did not find the anwser to my question here. HeliCal appears in the Windows and Mac OS taskbars (most people do not want this). Saved private calendar addresses are not encrypted. No support for proxy server authentication. Retrieving calendars is slow and often displays error messages. We are currently fixing these problems. Come back soon to download HeliCal v1.1.